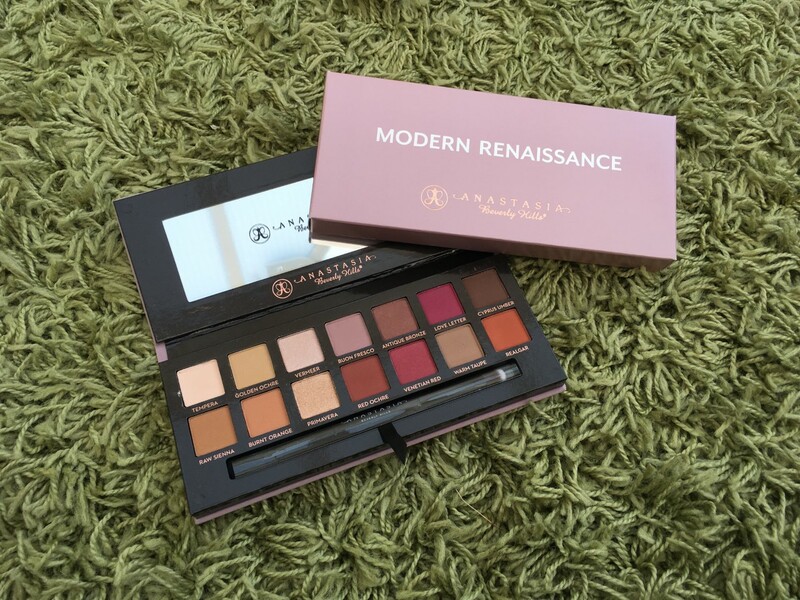 Is the Anastasia Beverly Hills Modern Renaissance Palette worth the hype? IT TOOK ME SO LONG TO GET MY HANDS ON THE ANASTASIA BEVERLY HILLS MODERN RENAISSANCE PALETTE… AND I CANNOT EXPRESS MY EXCITEMENT ENOUGH. Okay, so I have one small confession to make – I have the world’s biggest phobia of velvet so the packaging, although extremely luxurious, is an absolutely nightmare for me (I tend to grab the cardboard corners and try to flip the lid using another fabric as a barricade). Besides this, the product cannot be faulted in the slightest. As it was my first time using this palette, I knew that this look could have been improved, however, I was pretty pleased with the results. To create this cut-crease, I blended ‘Golden Ochre’, ‘Buon Fresco’, ‘Venetian Red’ and ‘Love Letter’ along the crease, then defined the lid using a concealer and packed ‘Buon Fresco’ on top of this. Completing the eye makeup look with a flick of Kat Von D Tattoo Liner and some Eylure falsies. The second time I turned to the Modern Renaissance palette, I decided to create an orange/brown eye look with dramatic flicks, using the following shades: ‘Golden Ochre’, ‘Burnt Orange’, ‘Raw Sienna’ and ‘Warm Taupe’ (below). Not forgetting the third time I used Modern Renaissance, when I created a sharp lid look and dramatic brown crease, using the brown shades above, my go-to Nars Radiant Concealer on the lid and then a layer of the oh-so-shimmery ‘Vermeer’ shadow on top, with… you guessed it, huge flicks and lashes on top. I’m absolutely chuffed with the range of colours and pigmentation of every shadow within this palette and would 100% recommend that you all make the £40+ investment if you haven’t already… it’s totally worth it to take advantage of the variety of silky, blendable eyeshadows. What do you think of the ABH Modern Renaissance palette? Has this review left your bank account £40+ lighter? That looks gorgeous, I love how the looks turned out. I recently got my hands on this palette as well but it’s still unopened, can’t wait to start playing with it! I literally love this palette and it’s definitely my favourite from 2016. The shades are gorgeous and so creamy, blendable and pigmented. I love the looks you created! I think I might have to try them myself! Your looks are amazing! I’d love to get my hands on this palette but i’ll need to get saving my pennies! I’m dying over that wing liner right now, slayyyy!! Literally one of the best purchases I have ever made! Great look! Cant wait to get my hands on it!!! This palette is so dreamy! Definitely need it in my life so I have an excuse to play around with all the gorgeous colours. I love the looks you did! I absolutely love this palette! You created some awesome looks with it, I wish I was even half as good with liquid liner as you are! The self made pallette is great, I need to get my hands on this after seeing your photos!! I cannot live without this palette now! It’s so beautiful. One of my favorite Anastasia products. I love this palette and am really thinking of purchasing it!